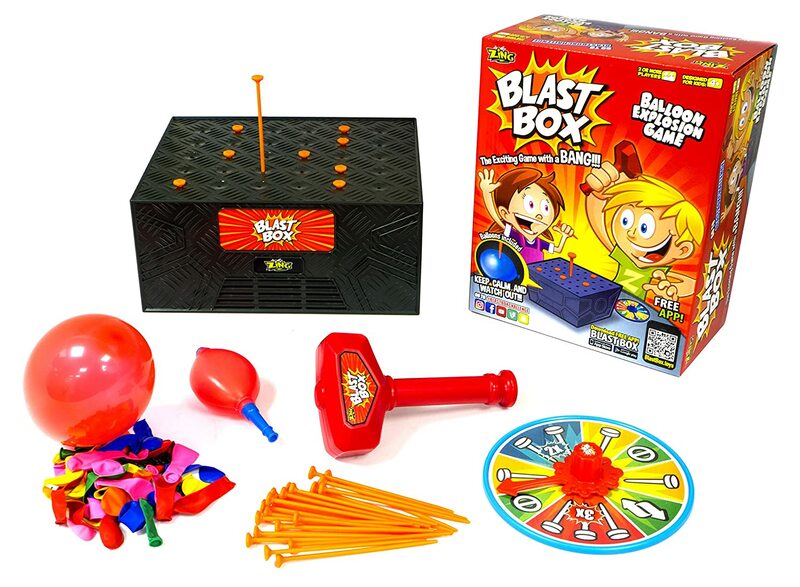 The creators of Wet Head have added to their collection of suspenseful fun with the introduction of Blast Box, a new exciting game with a Big Bang! 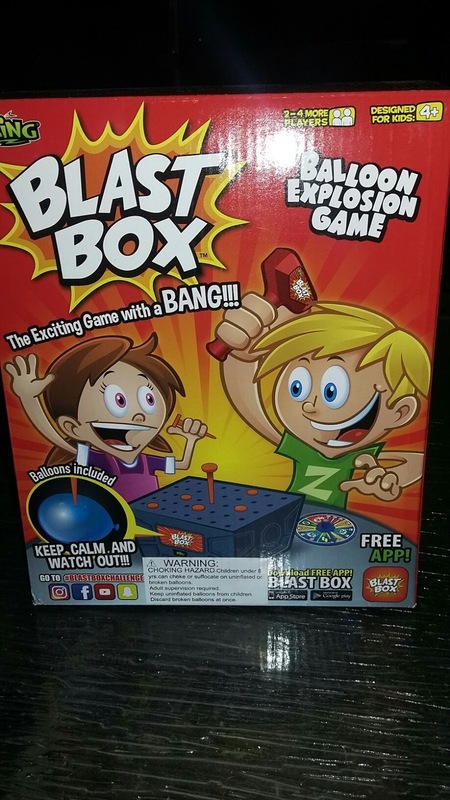 Blast Box is a fun family game, keeping kids and adults at the edge of their seat. Fill the box with balloons and use the spinner to determine how many pins to hammer into the box. If your pin pops a balloon, you are blasted out of the game. 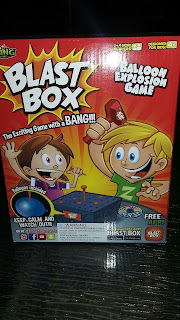 I received the Blast Box game for review and knew it'd be right up our alley. It's very simple and very suspenseful. Most of us cringe at the sound or thought of a balloon popping. That's where the suspense comes in. That, and not wanting to lose. 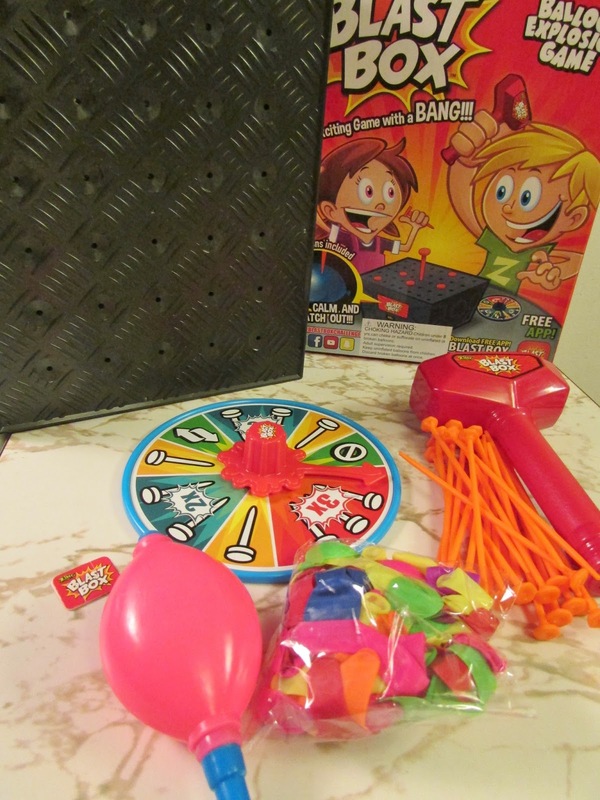 The Blast Box game includes a balloon inflator, 100 balloons, tie clips, plastic hammer, plastic pins, a spinner, and a plastic black box. The game can be played with 2 to 4 players. The first thing you need to do is inflate one balloon per player with the inflator. The balloons are small, and the branded tie clips keep them from deflating. Once you've done that, you place all the balloons under the black plastic Blast Box. You then start the game. Players take turns spinning the spinner to see what the indicated action will be. For instance, if you land on a 2X spot, you will have to hammer in two plastic nails. The spinner also includes a reverse and a skip space. Each player will keep taking turns until there's only one balloon remaining. The person with that last balloon is the winner. Easy enough! The hammer and nails are made of plastic, and the nails do not have spiky ends. So, there's no concern for spiking yourself or smashing a finger. Although I have not done so, you can download the free Blast Box app to record and share your game on social media. The app also includes trivia questions and alternative game play. 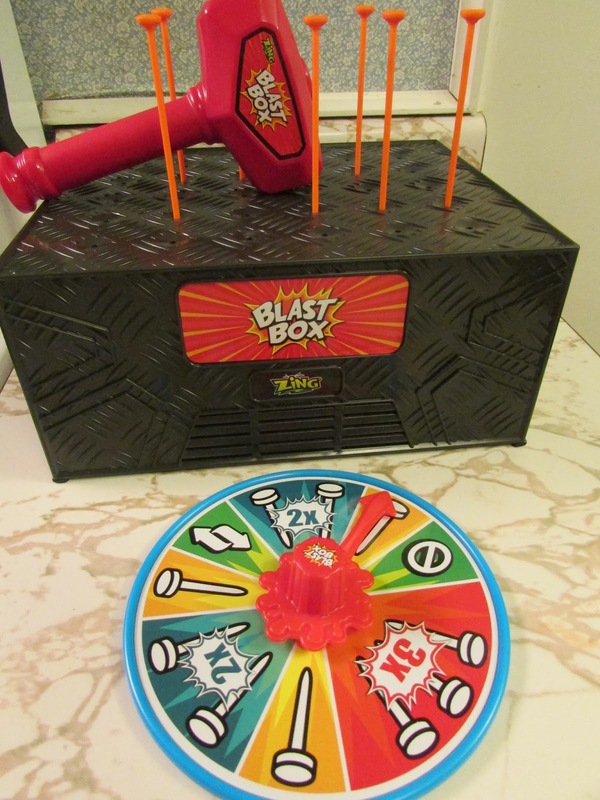 One person will win a Blast Box game. We still like Shoots and Ladders. Scrabble is our go to game! I like Scrabble. It's a challenge for me. War was one of my favorite card games to play and my kids have also enjoyed playing it. We like the board game Trouble. We are an Uno family. Candy Land is my favorite board game. Lots of childhood memories. We love to play Yahtzee! My faves are Scrabble and Uno. Spot It is one of my favorite card games. We own three different versions, and it is THE ONLY game that everyone in my family will play, from the nanas to the 10 year old down to the 4 year old. Love it! I like Uno but my kids like Monopoly! We like Apples to Apples! My all time favorite is Dream Phone. My daughter played it and talked me into playing with her. It is great. When we play board games, my grandson Carter loves to join us. I would have to say that we play Paw Patrol (Trouble) the most. My favorite game is Stratego but my girls don't like that or Risk. We like to play UNO! My grandson and I love to play the game Sorry. We love playing Castle Panic. Our favorite game to play is Don't Break The Ice! One of our favorite card games is Phase 10. It's really a lot of fun. I entered the dog's purpose giveaway. I'm not sure what happened with the r-form. I like to play skipbo. We love all board games, but our favorite right now is definitely Monopoly and Uno. My favorite board game is The Game Of Life. One of my favorite board games to play is the game "Sequence"
we really enjoy SKIPBO card game easy for all ages. Our family's favorite game is Switch!. We play it any time we are all together. We love to play Sorry! I love to play Sorry! Our family favorite is rummy! We play it all the time. We enjoy playing Monopoly, Uno, and Yahtzee together as a family. I love to play the card game Monopoly Deal! We like playing The Game of Life. We love to play Clue! My favorite board game to play is still Scrabble since it is both fun and makes you think and learn. Yahtzee is our favorite family game! One of our favorite games to play is Headbanz. My favorite board game is Sorry. My daughter and I love Yahtzee. Our favorite games to play on game night are Sorry, Uno, and Phase 10. I love Racko and Phase 10. But really, I love most games! I like to play Monopoly the most of the board games. I've always loved Candyland, lot of nostalgia for me!